For Scott’s birthday we took the day off and traveled to a nearby hotspring town, Yufuin, in Oita Prefecture. 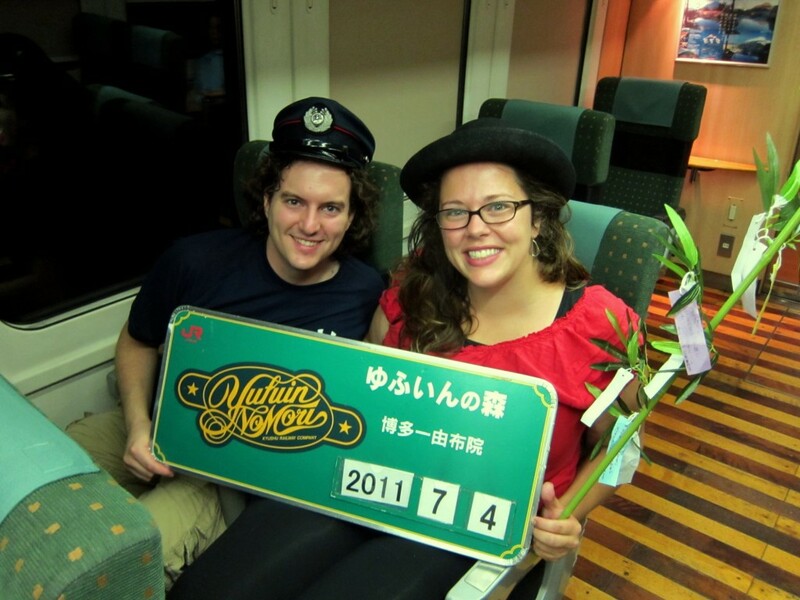 While Yufuin was lovely, full of quaint shops, natural hot springs baths, and delicious food, the highlight of the day for us was taking the train. 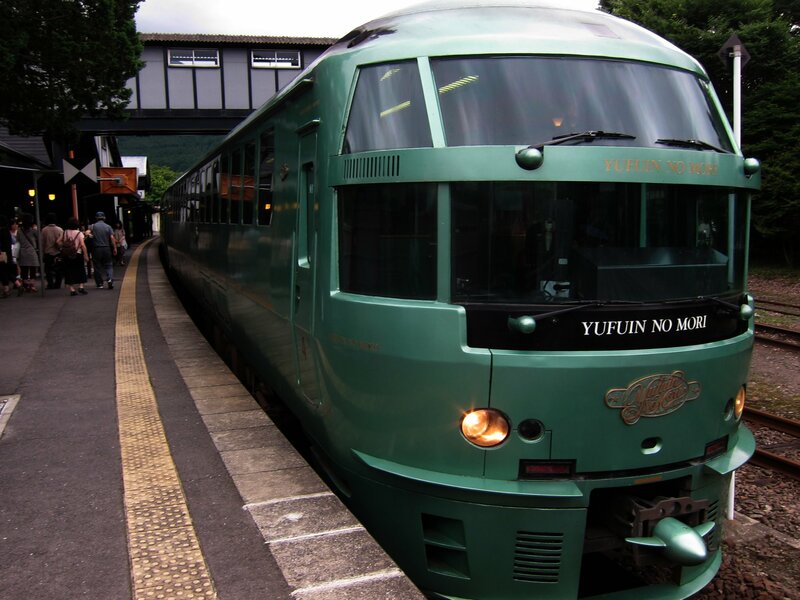 Yufuin no Mori, meaning Yufuin’s forest, is a luxury train that travels from Fukuoka to Yufuin and back 4 times a day. At the time we had no idea it was a special train, but knew that it took about half the time as the local, and cost only $10 more. It quickly became apparent that this was no ordinary limited express. The interior of the train was covered in wood, and the area in between the carriages were large open spaces, and the seats were wide and comfy. After departing, an attendant came around with props to take pictures of tourists, on their own camera. Whenever we passed a scenic area, announcements were made in English and Japanese and the train slowed down as we passed. This week is Tanabata – or festivals of the stars. Legend has it that there are two star lovers who are separated by the milky way and can only meet once a year, on the 7th day of the 7th month. People all over Japan make wishes for clear weather so the stars can meet, and also wishes for themselves. They write these down and hang them on trees. The train ladies were happy to explain this tradition and help us to fill out our own wish and hang it at the station. 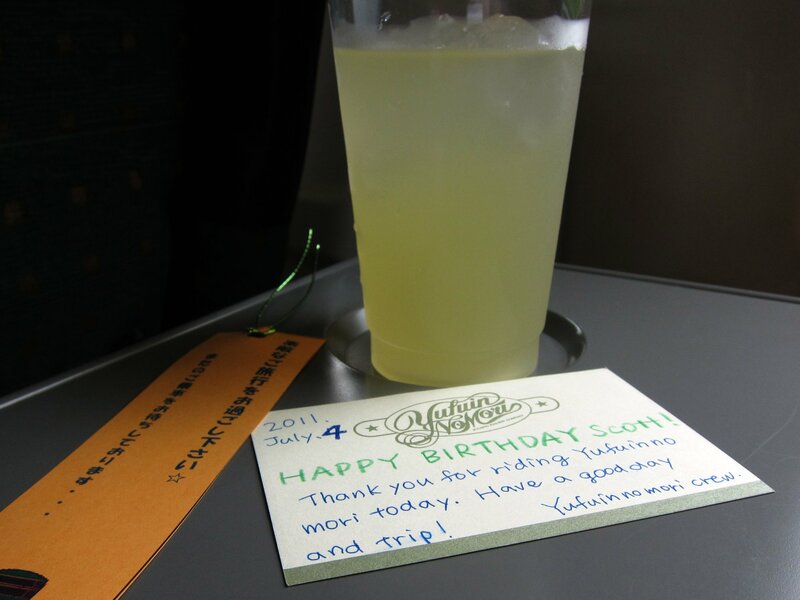 Because it was Scott’s birthday, they gave him a free drink and a little card, and on the way back, the girls counted 27 candies into a cup and presented it to us as we left the train. Being extremely visible minorities here, along with Japan’s tradition of amazing customer service, has meant that we received special treatment a lot. It’s a strange feeling, to be so easily picked out as different. A little unnerving, but people have been nothing but extraordinarily kind to us here, and I am going to miss interacting with Japanese people a lot.